Heligfjäll Eko System: Great people make great workshop! 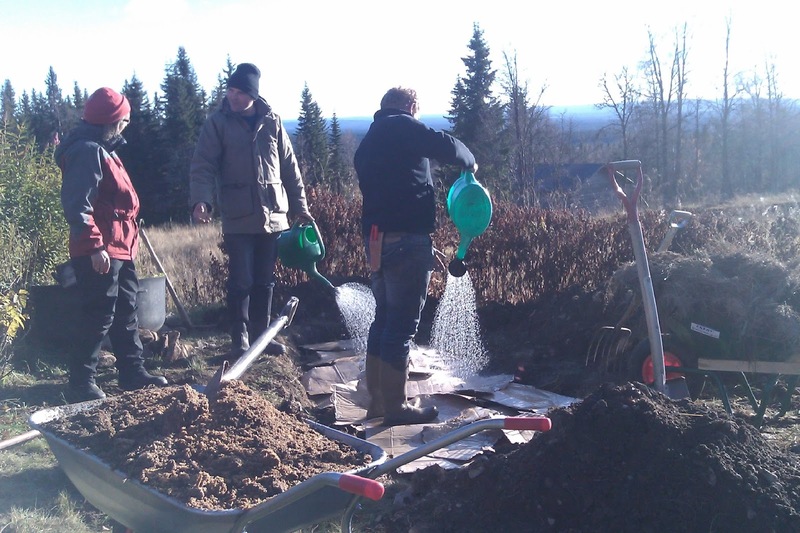 Last week we enjoyed a permaculture workshop together with Josef and Richard from the Krameterhof in Austria. I would like to thank them and also every one of you who took part for your enthusiasm and energy, it was really an amazing experience, exceeding all of our expectations! The result with 2 ponds, 3 terrace gardens, micro climate planning, grafting and building a hugelkultur (or raised bed) was terrific! Building a raised bed as a Hugelkultur the Krameterhof-way.Start with the branches, the ones of dead wood and the leaves from the forest, then the turf with grass down covered with cardboard. Then layer after layer with hay, silage, manure, more branches. Cover the bed with sifted soil where all stones have been taken out and hay or silage on the top. This bed will now be perfect for planting vegetables next spring! We learnt that the quickest way to get fruit trees up and running, or maybe I should say up and blooming, is to graft the sorts we choose on to existing rowans (Sorbus aucuparia, Eberesche). This will work very well with pears and apples. Luckily we have plenty of rowans on the property for this experiment. The terrace gardens will make it possible to develop rich, living soil and to grow all the vegetables we could possibly need. Microclimates will be created with stone walls and timber walls which store warmth during the day and give it out to the earth and the air at night. Long term physical goal is to become self sufficient. Old spruce in the protected forest, maybe 400 years!